Qatar Airways has finally committed to a date for the launch of its Dublin route. Services will start on 12th June. It will use a Boeing 787 Dreamliner which means that you will get the newest version of Qatar’s impressive business class seat as pictured below. 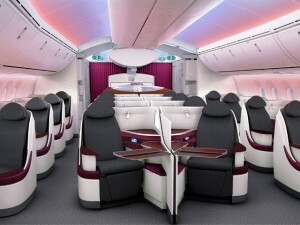 You can read my review of Qatar’s 787 business class seat here. With no Air Passenger Duty to pay out of Dublin, there are likely to be some excellent opportunities here for good deals for UK residents. The story then went quiet. This was not surprising since projects at Heathrow have a habit of slipping massively behind schedule as the Cathay Pacific lounge relaunch showed. In a recent interview with Business Traveller, the Plaza Premium CEO shone some light on the project. The Terminal 5 is now due to open in the second half of 2017 with 156 seats, lower than originally planned. I still have no idea where it is meant to be! Before that we can expect a Terminal 3 arrivals lounge (January) and a Terminal 4 arrivals lounge (Q1 2017) although I would take these timings with a pinch of salt. Details of all of the Heathrow Plaza Premium lounges are here. The Head for Points Christmas party! Thank you to everyone who attended the HFP Christmas Party last night. It went well, I think! Hopefully we can get some photos up on Thursday morning. Thanks to the Melia White House hotel for their substantial (I’ve seen the drinks bill …..) support. Do you need travel insurance to cover your redemption ticket? OT: whats the deal with all these shops listed on the Amex Shop Small promo, simply not accepting amex at all. They probably theoretically can accept Amex – though shop may not have set the till/ payment parameters to accept it – or they may have a mgt policy of not accepting Amex (the old high fees) even though the till can handle it. I guess Amex have a list of shops where they think Amex is accepted and have included them in Shop Small, presumably without the shop knowing anything about it. OTOH I have been buying my stamps in shops I used LY, even though they are not on the map this year – all working fine so far. What was it like with the introductions? I imagine: Hi, my name’s Rodney Patterson-Smythe-FitzPatrick – er, Genghis! Personally, I found the introductions easy with the help of the constant supply of alcohol! The two fool-proof opening lines at any frequent flyer event …. Well done Anika for arranging such a great get together. Thanks to Rob and Melia for the drinks.